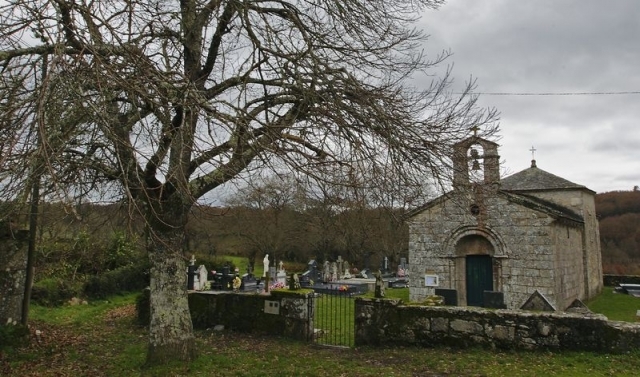 This hamlet is situated in the council of Guntín and, it is one of the few places offering services to pilgrims on their journey from Lugo to Melide. There is a bar/shop, which has, for many years traditionally, served pilgrims allowing them chance to recuperate strength and replenish supplies. It is also a good place to acquire local information. Very close by there are two albergues. One is public, a little small with 12 places and, another, privately owned is that of O Cándido, located next door and it offers 26 places priced at 8 euros a night. Phone numbers: +34 637 563 755/ +34 982 050 480. A third accommodation option is the hostel Cruz da Veiga (phone: +34 982176565) of Guntín-the capital of the council-. They collect pilgrims by car and return them to the same place the following day to continue their Camino. In this hamlet pilgrims are faced with two choices. The first, on the supposed official Camino, departs from San Roman da Retorta and heads towards Ponte Ferreira via Santa Cruz da Retorta and Vilamaior de Negral. The route that is signposted with shells and milestones. The second option is the known Roman road. It departs from where the two albergues are located and has been an official route on the Primitive since 2012. It is not signposted by shells or milestones but rather by yellow arrows. It is a different route, somewhat shorter, to reach Ponte Ferreira where it connects with the other route. Both routes pass through small locations without services and are surrounded by leafy vegetation but still involve rather a lot of road walking. If you are traveling on the Camino de Santiago or are planning to do so soon, you should know that the distance separating San Romao da Retorta from Santiago de Compostela is 94 kilometers.